Whether in the natural environment or a constructed water-treatment plant, there are several key processes that occur during water treatment: dilution, coagulation and flocculation, settling, filtration, disinfection, and other chemical treatments. The quality of the source water and the effectiveness of source-water protection and management have a direct bearing on the complexity of the treatment that is required. Source-water protection is the first step in water treatment, with the natural and engineered processes following. The processes in a water treatment plant are shown in the illustration. Coagulation removes dirt and other particles suspended in water. Alum and other chemicals are added to water to form tiny sticky particles called "floc" which attract the dirt particles. The combined weight of the dirt and the alum (floc) become heavy enough to sink to the bottom during sedimentation. source: AWWA Drinking Water Week Blue Thumb Kit. amount of concern about risks. A common saying in the past was "the solution to pollution is dilution." This is not the most efficient treatment method because even small amounts of pollutants, such as some pesticides, can build up, or bioaccumulate, in body fat over time. It is also not the preferred raw water intake water prior to any treatment or use diatomaceous earth a chalklike material (fossilized diatoms) used to filter out solid waste in wastewater treatment plants; also used as an active ingredient in some powdered pesticides approach because it sends the message that polluting the environment is an acceptable course of action. Coagulation and Flocculation. Sometimes, the particles that need to be filtered out during water treatment are very small. This makes them less likely to settle out and less likely to be filtered out. Chemicals called coagulants and/or filter aids are added to the water and mixed in (flocculated) to make the fine particles stick together to form bigger particles that can better settle out or be filtered out more effectively. Depending on the microbial and chemical makeup of the water, different chemicals are used as coagulants. The purpose of these two steps is to improve the performance of the remaining treatment processes. Settling. For facilities treating water that contains a lot of solids, settling or sedimentation is a common treatment step. The process slows the flow of the water in a pond or basin so heavier items can settle to the bottom. If the water is not sufficiently slowed down, these items are carried along to the next step in the process, which is not desirable. For plants treating very polluted raw water, settling may be used as the first step in the treatment plant (presedi-mentation) and again following the coagulation and flocculation steps. Filtration. There are several methods of filtration used in water treatment. The selection of which type to use is generally a function of the raw water quality. As filtration implies, water flows through a material that removes particles, organisms, and/or contaminants. The material used is most often a granular medium such as sand, crushed anthracite coal, or activated carbon. Some facilities layer different types and sizes of media. Along with varying the size and type of filter media, facilities are also designed to operate at different flow rates through the filter media. Traditional filtration plants include slow sand filtration, high-rate filtration, and diatomaceous earth filtration. Another type of filtration that was more widely used in the late 1990s and early 2000s is membrane filtration. It occurs by forcing water through a membrane barrier. A membrane is like a high-tech coffee filter. As water under pressure flows through the membrane, contaminants and organisms are captured on the membrane and not allowed to pass through. Membranes are not well suited to highly contaminated source waters because the solid materials clog up the membrane almost immediately. Membrane filtration is gaining use in the United States for special applications and in combination with other types of filtration. Disinfection. 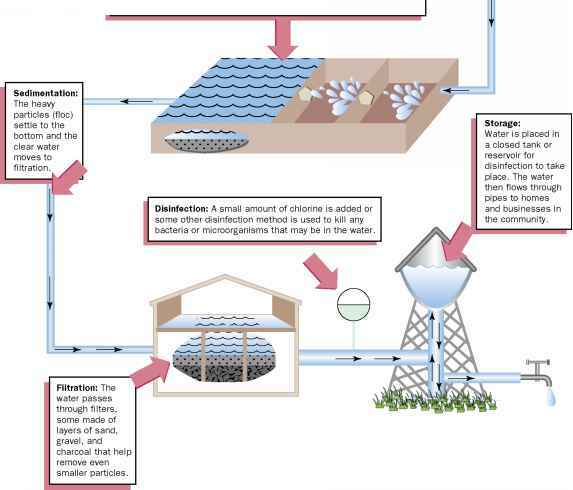 Filtration and the steps prior to filtration focus on the physical removal of contaminants in the water. In addition to physical removal, it is still important to provide chemical disinfection. Disinfectants used include chlorine, chloramines (chlorine plus ammonia), ozone, ultraviolet light, and chlorine dioxide. Chlorine was first used in the United States in a water-treatment plant in 1908. The advantage of chlorination is that it continues to kill bacteria as water moves through pipes to the tap. Its disadvantage is the possibility of disinfection by-products. Excess chlorine in water can combine with organic material in the water to form substances such as trihalomethanes, which can cause liver, kidney, or central nervous system problems, and are linked to an increased risk of cancer over a lifetime exposure. Disinfection is needed to inactivate (kill) bacteria and viruses that make it through the physical removal (filtration) steps. Viruses and giardia are effectively killed by chlorine. Over time, scientists have found that some organisms such as Cryptosporidium are resistant to chlorine. Cryptosporidium rose to public attention in 1993 when it sickened over 400,000 people, killing a hundred, in Milwaukee, Wisconsin. Largely because of this scare, new or amended U.S. drinking-water regulations developed early in the twenty-first century that expanded water treatment requirements specifically to address Cryptosporidium. Although chlorine is not effective against Cryptosporidium, alternative disinfectants such as ozone and ultraviolet light do appear to be effective at killing it. In Europe, both of these disinfectants are often used without chlorination to kill bacteria in the water supply. An amendment to the SDWA requires that all sources of potable water in the United States be filtered. In some locales throughout the nation, such as Boston and Seattle, reservoir water is essentially free of organic matter, and municipalities have been able to avoid filtration because they have extensive watershed protection and management programs in place. Other Chemical Treatments. Chemicals are added to drinking water to adjust its hardness or softness, pH, and alkalinity. Water that is acidic is very corrosive to the pipes and materials with which it comes into contact. 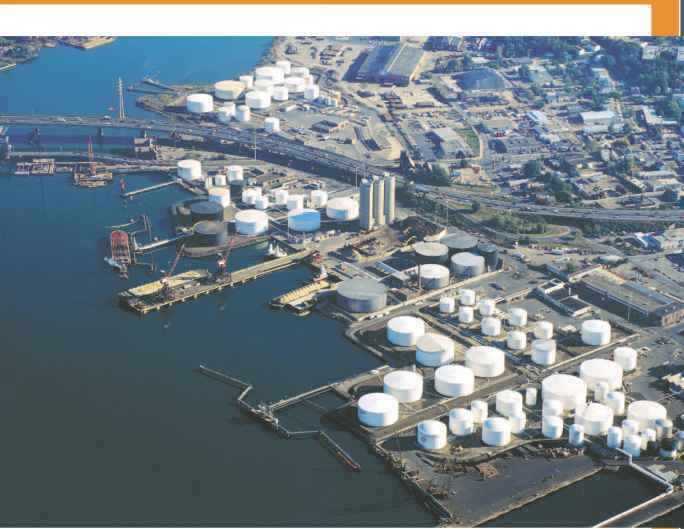 The addition of sodium hydroxide can reduce corrosivity and extend the service life of pipelines, storage tanks, and building plumbing systems. Pipes may also be coated with chemicals to prevent metals like copper from dissolving in the water. In addition, chemicals are used to reduce the leaching of lead from old lead pipes and lead-soldered copper supply pipes. Fluoride is frequently added to the water in many communities to improve the dental health of younger residents.